CloudWalker has advanced its lineup of TVs by introducing the new Cloud X2 TV in 40-inch and 43-inch sizes. Previously, the company had launched the Cloud X2 in 32, 50 and 55-inch models. The highlight of the new Cloud X2 is the Made-in-India content curation engine which can filter from thousands of pieces of content to get to you the trending relevant TV shows and movies right in front of you. The Cloud X2 comes powered by Android 7.0 Nougat OS with Quad-core ARM Cortex processor, 1GB RAM and 8 GB ROM. With the purchase of the new Cloud X2, CloudWalker is offering a free lifetime subscription to the Movie Box app, which includes a vast library of curated movies, documentaries & short films across different genres & languages. The collection of content combined with the content curation engine will bring the chosen material right at the fingertips of the viewers. Also, the TV comes with a Super Remote which comes with an in-built Air mouse for a simple point & click navigation. This functionality will also enable the users to wirelessly share content from phone to TV, mirror the mobile screen to TV & also use the mobile phone as a remote. The remote will also be usable as an air mouse or wireless keyboard with the CShare mobile remote app. Speaking about the specifications of the Cloud X2, the 40/43-inch model comes with a 1920 x 1080 pixels Full HD display resolution with a viewing angle of 178-degree. The TV has an 8.5ms dynamic response on the 40-inch model and an 8ms dynamic response on the 43-inch model. The contrast ratio remains 5000: 1 on the 40-inch variant and it is 1200:1 on the 43-inch option. The display comes with 260 nits of brightness. Inside the TV, there is a quad-core processor with 432 MHz Mali-450 MP3 GPU which comes paired with 1GB RAM and 8GB internal memory. On the software front, the Cloud X2 runs Android 7.0 (Nougat) with Content Discovery Engine. Connectivity options include WiFi 802.11 b/g/n, Bluetooth 4.2 LE, 3 x HDMI including 1 HDMI Arc port, 2 x USB, Ethernet. Like we mentioned above, there is the Super Remote with in-built Air Mouse. CloudWalker also facilitates mobile content & remote app for wireless media sharing from phone to screen which is available as CShare. For audio, the Cloud X2 features 20W (2 X 10W) Box speakers, DOLBY Audio and DTS- HD audio dual decoding. 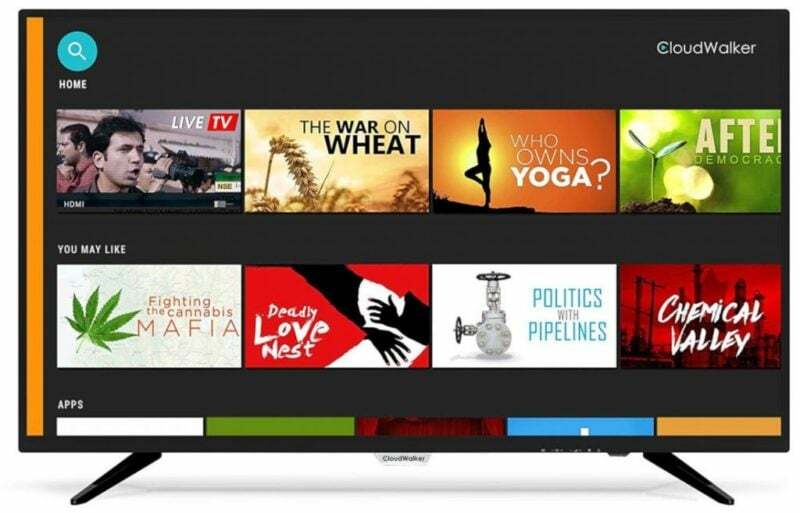 The CloudWalker Cloud TV X2 40-inch and 43-inch Full HD TVs will be available exclusively on Amazon at a starting price of Rs 24,990. During the Amazon Prime Day sale, the 40-inch Cloud X2 model will be available for Rs 23,490, while the 43-inch model will be up for grabs at Rs 25,490.